Open the door of Land Rover’s 2011 Range Rover Sport and see why the company has such a stellar reputation: They get it right. From the fit and finish of the interior to the vehicle’s off-road abilities, the Range Rover Sport is the perfect machine. It does what it says it will: help its driver and passengers surmount all reasonable (and some unreasonable) obstacles in complete comfort. Better than anything else on four wheels. 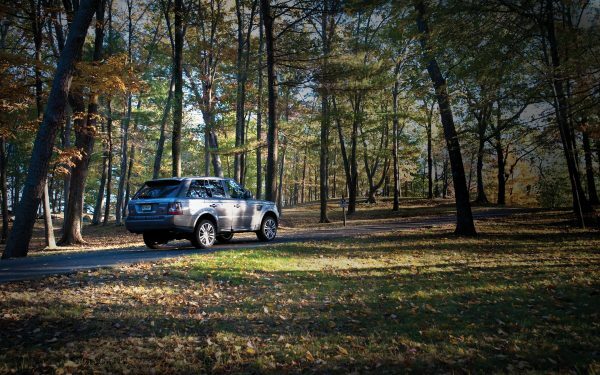 Touring through coastal Connecticut’s densely packed network of Colonial villages in Land Rover’s 2011 Range Rover Sport, it’s hard not to believe that the vehicle was custom-made for the area. A recent Nor’easter covered the rolling hills in a shower of autumn leaves and those, stuck to the roads by a constant drizzle of rain, are making things slick. No problem for the Range Rover. Thanks to a world of sophisticated traction control systems, we could be driving on a Texas highway in summer. And with the well-sealed interior holding steady at a spring-like 74, the only thing autumnal about the experience is the wash of vibrant colors outside the windows. It occurs to me that this is the essence of luxury travel, —to erase environmental distractions and thereby reveal the beauty of the journey, whatever the destination. For the world outside, it’s a cold and rainy day. But for us inside the Range Rover, untouched and unfazed by the elements, fall is glorious and wonderful. Land Rover’s latest Range Rover Sport, a vehicle first added to the model lineup in 2006, shares a platform with the company’s LR4 (reviewed previously in Kingdom), but it’s a different animal altogether, evidenced in its styling and a few key refinements. At first glance, it looks like its more expensive brother, the Range Rover. In fact, it’s slightly smaller, despite sharing the LR4’s platform—near five inches shorter in the wheelbase and a couple of inches more trim overall. Interior dimensions are different as well, with the Range Rover Sport holding 33.8 cubic feet of cargo behind its second row vs. the LR4’s 44.3. The rear seats fold down, of course, more than doubling load space so there’s plenty of room for ski gear or golf clubs, camping equipment or even a five-course picnic (there’s a small refrigerator in the console between the two front seats for the caviar and a few cans of soda). Though it might be a bit smaller overall than its higher- and lower-priced siblings, the Range Rover Sport excels in both comfort and performance. The elegant, fully adjustable and superbly finished leather interior is a delight for everyone inside, while off-road performance is in line with Land Rover’s best—that is to say, it’s exceptional, with formidable approach and ramp angles, a wading depth of more than 27 inches and nearly nine inches in off-road ride height to keep you above the fray. For most of our New England jaunt we kept it nice and low at 6.7 inches, the standard ride height, which made our Range Rover Sport handle more like a performance car than an off-road monster. Full-time four-wheel drive and the powerful V8 kept us rolling along (it’s offered with a 510hp supercharged V8 or a naturally aspirated V8 engine that comes in at 375hp), while the six-speed adaptive automatic transmission made sure the ride was smooth and controlled. An upgraded version of the standard CommandShift six speed, our transmission adapted to an individual’s driving style and accounted for surface conditions. Had I wanted to, I could have manually selected the gears, but it was easier to leave things to the Range Rover Sport—and it never let me down. Handling was further assisted by the vehicle’s Four-corner air suspension, which features Land Rover’s revolutionary Terrain Response system. Basically, via a clearly marked dial on the console, drivers can select the terrain they’re traversing and the vehicle adjusts accordingly. Rather than raising or lowering the Range Rover Sport, or simply stiffening or loosening the suspension, the system actually makes a world of complex adjustments to the engine, transmission, suspension and traction control settings. In extreme situations, Land Rover’s Hill Descent Control can even manage a tricky slope for you, while Hill Start Assist does exactly what it says, ensuring traction is maintained no matter how steep your starting grade. In our hilly and wet conditions, we made more use of the Range Rover Sport’s Dynamic Stability Control (DSC), which monitors traction and applies the Anti-Lock Braking System (ABS) to individual wheels, helping to correct errant trailing. Likewise, the Four-wheel Electronic Traction Control (ETC) system monitors each individual wheel’s speed and ensures drive is applied where it’s needed. Of course, while these millions of corrections and changes were being applied, we drove along blissfully unaware, simply enjoying the trip and the colorful foliage outside. The electronic complexities under the hood are in contrast to the classical simplicity of the Range Rover Sport’s immaculately finished interior. Our vehicle featured the upgraded interior in black leather with contrasting ivory stitching. Wood and leather trim abounds, completely covering the cleverly styled seats and dash and giving the overall impression of functional luxury and class. Land Rover’s Command Driving Position is put to good use here, with all controls easily accessible and the driver given a secure post from which to operate in any conditions. It’s a matter of opinion, but we love Land Rover’s taste when it comes to tech vs. old-school. The speedo and tach are simple needle gauges, headlights are activated by a basic switch and there’s an analogue clock on the dash—all huge pluses, as far as we’re concerned. The heated seats, digital climate control and comprehensive system and touch-screen that control everything from the top-end audio package to navigation and monitoring of vehicle systems are left to computers, and the Range Rover Sport is better for it. As with the vehicle’s other systems, there’s a perfect sense of balance between hands-on and automated. The key is a bit weighty for our taste, but it activates a range of functions, including the push-button start and instant awareness for unlocking doors, so we’ll give it a pass. For a first-time Range Rover Sport driver, it is quite remarkable to witness the vehicle come to life as one approaches and pushes the “unlock” function on the key: Side mirrors deploy, a light illuminates the ground in front of the doors and the door opens without a hitch. Fantastic. Same goes for the electronically adjustable driver’s seat, which can memorize a number of different drivers’ preferences, and niceties like the aforementioned cooler box in the console, sunroof, “one touch” windows and interior mood lighting. In terms of aesthetics, the interior looks phenomenal, fully complemented by a range of deep exterior colors and standard 20-inch wheels that do as much for the looks as they do for performance. Six airbags, immensely strong brakes and the latest in stability software keep things safe, while a fully integrated portable audio interface and Bluetooth connectivity keep things cutting-edge. We actually took our Range Rover Sport off-road: A few tricky sections of a local state park offered an irresistible challenge. Without question, the vehicle performed flawlessly, making the off-road sections of our trip as comfortable and carefree as the highway sections. That said, we understand that many of the brand’s fans choose not to get their Land Rovers dirty, preferring simply to enjoy the capabilities of their vehicle without testing its limits. Fair enough: The Range Rover Sport is a luxury vehicle and should be enjoyed as such, but the real beauty of Land Rover’s creations is that luxury is only half the equation. The vehicles are perhaps the most consistently rugged off-road animals rolling today and to stay on-road is to miss the point, we think. If you’re considering owning a Land Rover, or even if you just want to know what the fuss is about, we suggest a Land Rover Experience Driving School. Offered at a number of locations worldwide, the schools will open your eyes to the incredible world of Land Rover and will certainly help you understand why, like the LR4 we tested last year, it was so difficult to hand over the keys to the 2011 Range Rover Sport when our evaluation had concluded. Impeccably finished, beautifully designed and ruggedly capable, this is a vehicle everyone should drive—if not own—at least once.